The Cincinnati Reds are behind one of baseball's most disappointing starts. At 5-11, they're stuck in last in the National League Central -- a position they (comendably) tried to avoid during the offseason. The Reds fielded a payroll this Opening Day $25 million higher than last. They spent the winter acquiring well-known veteran rentals: Yasiel Puig, Matt Kemp, Sonny Gray, Alex Wood, and Tanner Roark. Competing in the toughest division in baseball might have been a tall ask, but the Reds considered it worth an attempt. So far, that attempt has failed. Much of the blame should be placed at the feet of the lineup. What was supposed to be one of the NL's finest has instead been a letdown. Joey Votto entered Wednesday with an 88 OPS+ and yet his numbers are Ruthian compared to some of his teammates. The Reds have just three players with more than 20 plate appearances and an OPS+ over 100. Conversely, they have four under 50 -- including both Puig and Kemp, whose combined OPS+ (65) is only a tick higher than that of a different member of that trade, the oft-forgotten Kyle Farmer (59). However poor the Reds lineup and playoff aspirations are at the moment, there have been some bright spots over Cincinnati's first 16 games. And, encouragingly for a team that has struggled to develop arms, many of them have been young pitchers. Let's take a look at four youngish Reds who are preventing the season from being a waste of time. How well has Luis Castillo pitched? 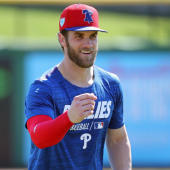 Among qualified starters, he has the third-lowest ERA (1.46), the eighth-highest strikeout rate (11.68 per nine), and the highest groundball percentage (58.7 percent). He hasn't allowed a home run in four starts. Credit Castillo's dominance in part to one of the best changeups in baseball: It checks in nearly 10 miles per hour slower than his mid-90s heat and features significant two-plane movement. Batters have missed on nearly six of every 10 swings they've taken on the cambio thus far. Castillo will need to improve his control as his hit and home-run rates regress, but aesthetically he's been the Reds' best player to date. Tyler Mahle doesn't feature Castillo's stuff or his big-league track record. Nonetheless, he has accumulated a 2.65 ERA and 3.75 strikeout-to-walk ratio in his first three starts this season. Mahle leans heavily on two largely average offerings: a low-90s fastball and a breaking ball that looks like a curveball but is classified as a slider. Between Mahle's arsenal and his crossfire delivery, it's probably no surprise that he has platoon issues: he's held righties to a .647 OPS against in his career, yet lefties have thumped him to the tune of a 1.004 OPS. If he can refine his command and changeup, he could stick at the back of a rotation. Otherwise, he should find second life in the bullpen, perhaps as a righty specialist. Ralph Waldo Emerson once wrote that foolish consistency is the "hobgoblin of little minds." In Robert Stephenson's case, no consistency has been the hobgoblin of his big arm. Stephenson has a high-spin fastball and a pair of secondary offerings that have consistently generated swings and misses at the big-league level. He's just lacked the command necessary to make those pitches play up to par: He entered the year having allowed 1.6 home runs and 5.7 walks per nine innings in his 37 big-league appearances. It's early yet, but Stephenson in his first six appearances this season has allowed zero home runs and one walk -- and that was of the intentional variety. He's even throwing 69 percent strikes, as opposed to 60 percent before. There's no sense buying Stephenson stock in bulk … just keep an eye on him over the coming weeks. If he's turned the corner in a sustainable way, then that would be a huge boon to the Reds pitching staff. Formerly a two-sport star, Amir Garrett is now in his second full season as a big-league reliever. It's starting off just fine, as he has a 1.35 ERA and five strikeouts for every walk in eight appearances. Worth noting: Garrett has altered his approach, leaning heavier on his slider. Historically, that's been his swing-and-miss pitch, so don't be surprised if this is an intentional tweak that is here to stay.